From our Norfolk and Suffolk farms. Years of dedication to the art of mushroom growing means that our farms are now owned and managed by the second or third generation of the families who started them back in the 1950's. There are a range of growing styles, some remain in traditional English trays while others have moved over to Dutch style shelving systems. Each grower believes their system is the most effective with cropping, disease risk and picking speeds all contributing to the efficiencies. Harvesting is still all performed manually by a full time staff of over 200 pickers spread over the growing sites. It takes a long time to train a mushroom picker and it is an extremely skilled job to harvest the crop quickly but with no detriment to the quality. The farms are all Farm Assured accredited and the produce is regularly assessed for quality and provenance. In September 2015 the Waveney Mushrooms group consolidated the packing operation for the whole group onto one purpose built site in Swainsthorpe, near Norwich. The site was chosen, after a long search, due to it's location next to one of the main routes in and out of Norfolk and probably most importantly because it was central to all our growing sites in and around the Norfolk and Suffolk border. 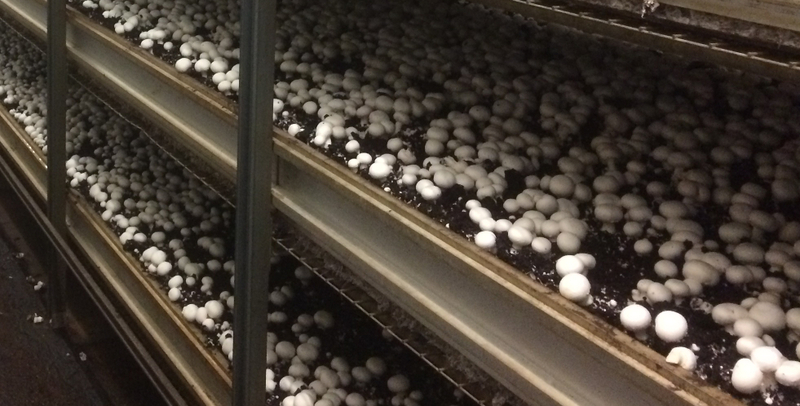 The packing operation works every day of the year apart from Christmas day to ensure the mushrooms harvested on the farms are kept within our constant cool chain system and presented to the customer in the best possible condition – as fresh as possible to the day they were picked. The pack house is BRC accredited and holds the prestigious AA grade from it's recent inspection in January 2017. 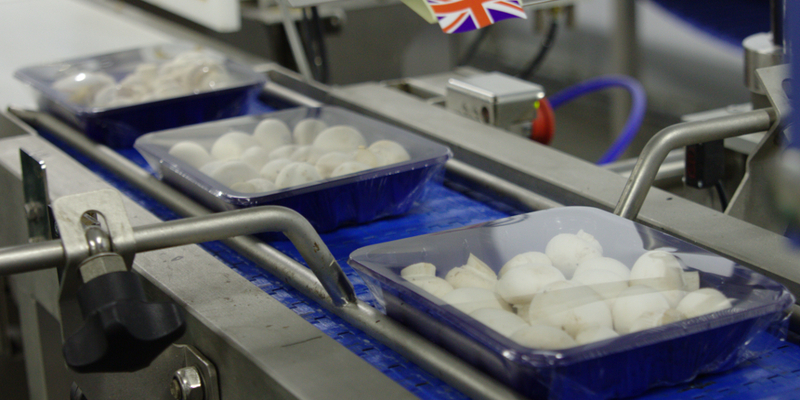 We also hold a Red Tractor licence enabling the mushrooms we pack to display the Red Tractor logo. 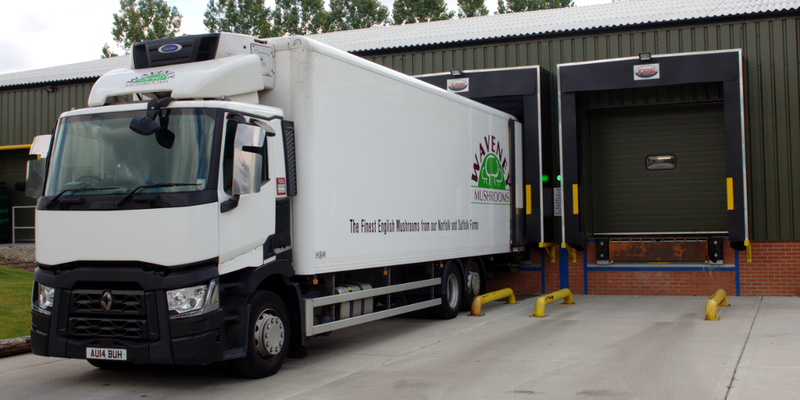 Waveney Mushrooms has always operated it's own fleet of refrigerated lorries to ensure a consistent cool chain environment from the farm to the customer. Our drivers understand the care necessary to keep the mushrooms in the best condition and many of them have worked continuously for the group for over 20 years. Our drivers and our fleet of lorries are the 'face of Waveney Mushrooms'; the image presented by our transport operation is vital to the long term success of the business. Our vehicles are used not only to deliver mushrooms to our customers but also to collect the raw crop from the growing sites. The refrigeration on the lorries is set at 2℃ in order to retain the freshness, colour and quality of the crop that is collected from the farms.